An ancient Latin plant name of doubtful origin, but possibly derived from the sound made in chewing the seed (Papaveraceae). Poppy. A widespread genus of 100 species of colorful hardy annual and perennial plants. Poppies like full sun, although some will flower reasonably well in partial shade. The newly unfolded petals have the appearance of crumpled satin and many varieties have a glistening sheen on the blooms. They produce seed freely and many hybrids have been raised which are very decorative and easily grown. When used as cut flowers they will last longer if the stems are burned when they are cut before putting them in water. This seals the milky sap in the stems. Perennial species cultivated P. alpinum, 6 inches, bluish-green foliage in neat tufts, yellow, orange, salmon and white flowers, summer, Europe. P. atlanticum, 18 inches, orange flowers, summer, Morocco. P. nudicaule, Iceland poppy, yellow, white and orange flowers, summer, sub-arctic regions. P. orientale, Oriental poppy, 3 feet, orange-scarlet, June, Asia Minor. P. pilosum, 2 feet, leaves form a green hairy rosette, orange-buff flowers, summer, Asia Minor. P. rupifragum, Spanish poppy, 2 feet, soft terra-cotta pink flowers, summer, Spain. Cultivars There are many delightful varieties of the poppies in many and diverse colors; the following is a selection from those currently available. 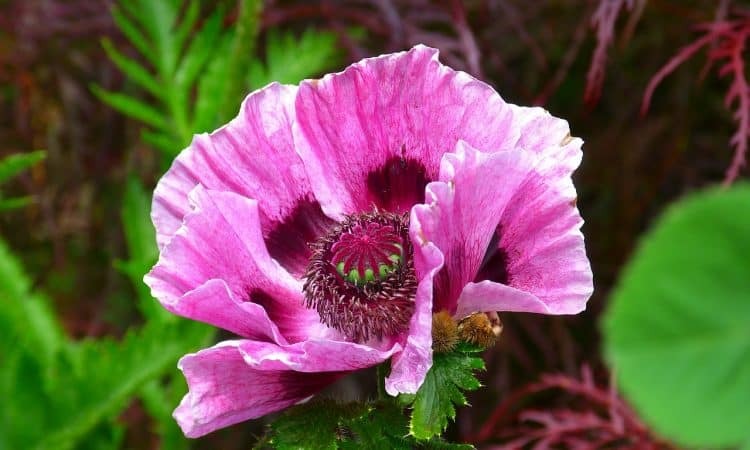 The annual varieties include the Shirley poppies, derived from P. rhoeas, single, and one of the best of all annuals; the double Ityburgh’ hybrids and the begonia flowered, also double in many colors and both also derived from P. rhoeas; from P. somniferum come the ‘Daneborg’ hybrids, scarlet with fringed petals. and four white inner petals, the carnation-flowered also fringed the paeony-flowered doubles, and ‘Pink Beauty’, 2i feet, with grey leaves and double salmon-pink flowers. The perennial varieties include those from P. nudicaule, such as ‘Coonara’, salmon pink and rose; ‘Golden Monarch’, ‘Kelmscott Strain’, rich mixed colours; ‘Red Cardinal’, crimson-scarlet; ‘Tangerine’, brilliant large orange flowers. Also varieties of P. orientale such as ‘Beauty of Livermere’, scarlet frilled flowers; `Grossfurst’ , crimson; ‘Lord Lambourne’, orange-scarlet; ‘Princess Victoria Louise’, cerise-pink; ‘Olympia’, light orange-scarlet, double early; ‘Queen Alexandra’, rose; ‘Perry’s White’, white with dark blotches; ‘Rembrandt’, orange-scarlet; ‘Salmon Glow’, salmon-pink, double; ‘Watermelon’, single large, cherry-red. Cultivation Sow annual varieties in April in patches where they are to flower. They prefer a sunny position and reasonably good soil. Thin the seedlings to 2 or 3 inches apart when quite small. Plant the perennial varieties in October or early spring in deeply dug, loamy .soil in full sun, and top-dress with old manure or compost in March or April. Propagation of the perennials is by means of root cuttings in winter, by the division of the roots in March or April or by seed sown in pans or boxes in a cold-frame in spring or on a finely broken-down seedbed out of doors in early summer, scarcely covering the fine seeds. P. alpinum and P. nudicaule are frequently grown as annuals or biennials (for the Welsh poppy see Meconopsis). Will the papaverflowers grow in the San Diego, CA climate?